Raising a puppy is fun and rewarding. However, it can be intimidating to try and potty train a puppy for the first time. We’ll look at a few simple tips that will help make it easy for you and your new puppy. Before you bring a new puppy home, try to plan ahead a little bit. 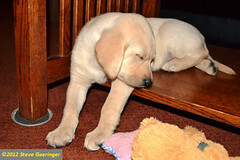 If you can, plan to spend the first week at home to help your puppy get situated and comfortable in your house. Lots of people buy a new puppy on the weekend and go back to work on Monday. The first several days will be crucial to get your puppy potty trained as soon as possible, so this is a bad situation to start off in. Planning ahead will allow you to spend time to help make your puppy comfortable and overcome any initial fears of a new environment. This also will give you the time to get your puppy used to a set schedule, which is very important in successful potty training. It’s also important to understand your puppy won’t be perfect. Expect to deal with some mistakes and accidents; it’s just going to be a part of the process. When you first bring him home, spread out a newspaper next to an outside door. If you catch him peeing inside, move him on to this newspaper, but don’t scold him. The key is going to be to gently teach him where it’s ok to go to the bathroom, and provide lots of positive reinforcement when he uses the right area. Take your puppy outside regularly, and make a big deal out of when he pees outside. Praise him, pet him, and use a consistent word he can get used to. ‘Go potty, good dog’ is a perfect phrase to use, and make sure to give him a lot of attention when he pees or poops outside. The stronger you can make the connection between him peeing outside and you petting him and praising him, the faster potty training will go. Along with using a consistent phrase, develop a consistent ‘good dog’ tone of voice. Most people do this naturally with animals, so it should be easy to do. Use this tone whenever you’re rewarding your puppy for behaving the correct way, whether it’s potty training or obedience training. If you catch your puppy peeing inside, quickly say ‘No’ in a firm tone, and move him to the newspaper. Once he’s there, then you switch to the ‘good dog’ tone to re-assure him. You can also use a little dab of urine from a mistake to mark the scent on the newspaper, so your puppy can associate peeing with the newspaper. Following these simple tips will help make potty training your puppy a quick and painless experience, both for you and for your new companion. For more information on potty train puppy or obedience training for dogs please visit http://mightydogtraining.com.